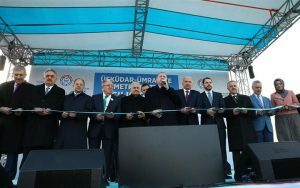 The first section of Istanbul’s fully automated metro line M5 opened on 15 December. 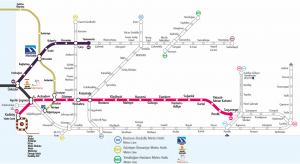 It runs from Üsküdar to Yamanevler, is 10.5km long and comprises nine stations. Line M5 lies on the Asian side of Istanbul, and connects with the Marmaray tunnel link at Üsküdar, where there are train services connecting to the European side the city. With Phase 2, the line will extend further east, deeper into the Asian side, to Çekmeköy-Sancaktepe, reaching 20 kilometers long and 16 stations. The estimated average ridership is 350,000 passengers per day after phase 2 opens. The current nine stations are: Üsküdar, Fıstıkağacı, Bağlarbaşı, Altunizade, Kısıklı, Bulgurlu, Ümraniye, Çarşı and Yamanevler. All are underground and are equipped with platform screen doors (half-height). Line M5 will be linked to metro lines M8 (Dudullu-Bostancı), M12 (Göztepe-Ataşehir) and M13 (Hastane-Yenidoğan) by 2023. All stations are accessible for disabled passengers. For the 9 stations of phase 1, 116 escalators and 39 elevators were deployed. On 7 December Qatar Rail, the Qatari national public transport operator, awarded joint venture RKH Qitarat the operations and maintenance contract for the automated metro and light rail networks of the capital Doha and the planned city of Lusail. RKH Qitarat is based on a consortium between RATP Dev and Keolis (49%) and the Qatari company Hamad Group (51%). The contract, for a period of 20 years, is estimated to be worth three billion euros. The networks will be launched in stages from the end of 2018, until the end of construction in 2020. Qatar Rail is currently in charge of building the new integrated urban transport network, which will include both the Doha metro and Lusail light rail. The Doha metro will be completely automated and driverless with 75km of track and 37 stations. It will be equipped with CBTC technology and will initially consist of three lines. 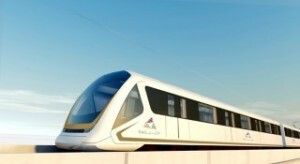 The Red line will serve the Lusail City International Airport in 36 minutes and connect with the metro network. The Green line will link Al Mansoura, to the east, to Al Riffa, in the west, and serve 11 stations. The Gold line will serve the Khalifa International Stadium, completed in 2016. The first part of the network will be largely underground and is due to start operating from the end of 2018, with 640,000 passengers a day starting from 2021. The mobilisation phase prior to the launch of this network will last one year, during which RKH Qitarat will have to recruit and train its new employees. Over the next three months, the number of employees is set to increase to 100, in order to reach the 1,500 employees required in two years time. Lusail is located 15km from Doha’s city centre and is currently being built. It is expected to house 240,000 residents once completed. 90% of the Qatari population currently live in Doha and its surrounding suburbs (equivalent to 2.6 million people), 80% of which are foreign workers. The Lusail light rail network will cover 18km of track and consist of four lines serving 25 stations in total. Half of the network will be underground. The first part of the light rail network is due to open to the public in January 2019, and construction of the rest is expected to finish in 2020. 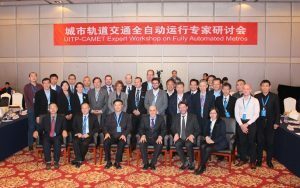 On 24-25 November, UITP and the China Association of Metros (CAMET) held a joint workshop on fully automated metros (FAO) in Beijing, with the aim of sharing knowledge and information on this topic. Growth of metro networks in China this decade has been exponential. According to data provided by Prof. Tang Tao of Beijing Jiaotong University, at the end of 2016 there were 127 urban rail transit lines in operation in China, with a total length of 3838 km, while a further 193 lines were under construction, for an additional 3700 km. 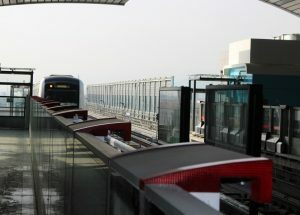 In terms of fully automated metros, after a small-capacity line (less than 300 passengers per train) opened in Guangzhou in 2010, two fully automated lines are set to be inaugurated in the coming days: the Yanfang line in Beijing, the first domestically-produced fully automated metro line, is due to open before the end of the year and Line 10 in Shanghai is to start fully automated operation on 1 January 2018. Fully automated lines are planned in several other cities in China. During the meeting, members of the Observatory of automated metros delivered presentations to Chinese metro authorities and operators on global trends in metro automation. In return, key Chinese metro operators and related organising authorities provided an introduction to automation projects and developments in Chinese cities. Experiences and views were exchanged on the role of full metro automation in the strategy of Chinese metro networks for the future. The UITP-CAMET Workshop included a technical visit to the Beijing metro network central operations control centre and to the Yanfang line, hosted by the Beijing MTR Construction Administration Corporation, which has built and will operate the line. In June 2017, UITP and CAMET signed a memorandum of cooperation (MOC) with China Association of Metros, the first result of which has been the organisation of the joint workshop in Beijing. 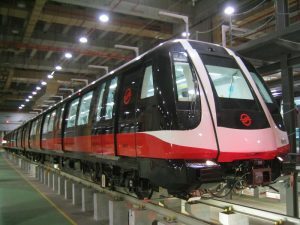 On 16 November, Singapore Land Transport Authority (LTA) and Alstom signed a contract to supply the signalling system for the Circle Line (CCL) final phase, stage 6. © 2016 UITP. All rights reserved.